Trader John has done it again! How much will the Indians miss GM John Hart when he steps down after this season? Hart sent crybaby set man Steve Karsay and damaged goods sidewinder RP Steve Reed to Atlanta for closer John Rocker and a minor leaguer. And his arrival has caused current Tribe closer Bob Wickman to state that he "will look to join another team after this season." On the surface, it appears that the Tribe didn't need this deal or the clubhouse distractions. However, the long term is why this deal was done and why I think Trader John still has something else up his sleeve. Karsay ($2.7 million salary in 2001), Wickman ($2.6 mil) and Reed ($1.6 mil) are all free agents after this season. Karsay, upset by his continued use as a set up man instead of a starter, already said he would NOT sign with the Tribe. Reed has been less than stellar - an 8-5 record and 4.56 ERA with no saves - since coming from the Giants where he had a 1.48 ERA. Also, left-handed hitters are 9-for-17 (.529) against Reed with three homers (ouch!). Rocker, on the other hand, is signed through the end of the 2004 season and will make $1.9 million in 2001. Add to that Rocker's numbers against the post season archrival Yankees: 0.00 ERA in 9 appearances with 8 strikeouts in 8 innings. Fan Spin: Rocker and Karsay will continue to have premium Fan numbers, but Wickman's value has just plummeted since his saves total will decrease. Typical Hart&ldots;he continues to make lemonade from the lemons. Not to be outdone - though the rumor was that they were - the Yankees swung a deal for set up man Jay Witasick from the Padres for minor league prospect D'Angelo Jimenez. Witasick, who went 5-2 with a 1.86 ERA in 31 games for the Padres, was needed to spell some relief for the rest of the Yankee bullpen. The Yankee bullpen has consisted of a two-man show, starring set up man Mike Stanton (1.87 ERA in 38 games) and closer Mariano Rivera (2.52 ERA, 23 saves in 34 games). The rest of the pen has been non-existent, especially Ramiro "I-just-signed-a-fat-spring-training-deal" Mendoza (5.23 ERA). Jimenez was a supposed future All-Star shortstop for the Yanks - even rumored to be a possible replacement for Alfonso Soriano at 2B if Soriano continued to struggle. As always, there's more than meets the eyes (especially in any trade with the Yanks) - Jimenez suffered a broken neck in an off-season car accident after the 1999 season. Fan Spin: Witasick is worth a roster spot due to his low ERA and WHIP (1.19) but wait until he settles in with the Yanks before starting him. and a .252 BA. 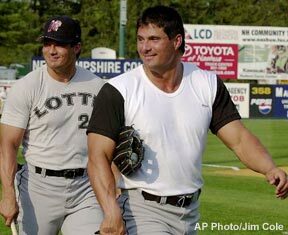 After being released by the Angels in spring training, Canseco joined twin brother Ozzie (pictured with Jose) on the Newark Bears of the independent Atlantic League. He batted .284 (38-134) with 7 home runs, 27 RBIs, 40 walks and 10 stolen bases in 41 games. Fan Spin: Again, he's 37 but he can put up some numbers. He was MLB's first 40-40 man (40 HRs and 40 stolen bases).